We are aware that the last step of the "Love Hurts" quest requires you to earn 500,000 honor. This is a mistake. We will be releasing a fix that changes the requirement to 250 honor tomorrow. The fix will not undo any quest progress. We apologize for the inconvenience. Edit: The fix is now live. Thank you for your patience. I literally choked on my drink while out at a restaurant when I saw the 12/12 requirements pop up. 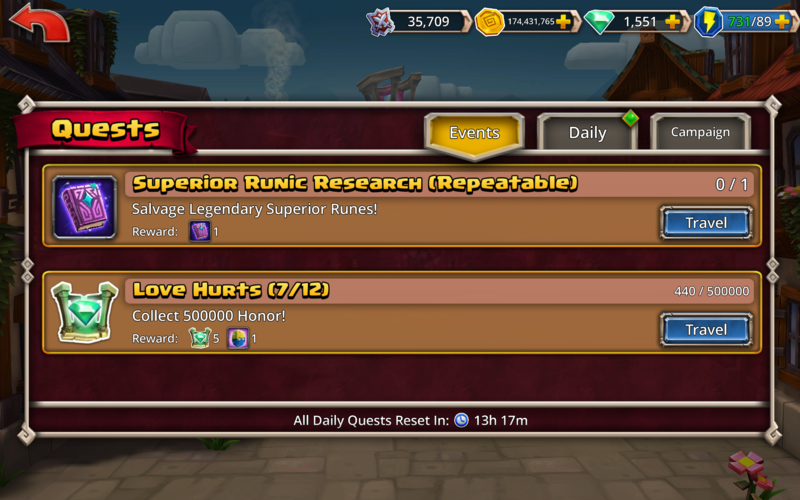 Mine's currently showing as Love Hurts 7/12 quest = collect 500000 Honor. I already did 11/12 so not sure why 7/12 would be showing this. I'm also showing only 1 gem for the daily quest rewards for each quest that used to give 3 or 5 gems. I hope this isn't another Scrooge effect being snuck in during an event that's drawing attention elsewhere. @Barleyman Do you have a screenshot of that? @joel I also already did 7 through 11. But now back at 7. So just to make sure you did say 250 honor correct, two raids? 9 use nimb’s 1st ability etc. Can I ask here if the event dungeon will refresh the dead heroes? or it will just continue like that to the end of the event ? Heroes will refresh each day when a new dungeon is opened. It should be 250 per Joel. There will be a fix, though not sure when, guessing at 3pm CST today hopefully. It's just sad their attention to detail and QA is really bad. The fix should be released in the next few minutes. My heroes didn’t reset. It cost me 500 gems to reset them.